The kitchen is the heart of every home. Being the busiest part of the house, it is essential to keep it clean and organized. Most homemakers prefer to have enough available supply of food and other cooking essentials to make the daily family meal preparation with ease. While it is necessary to maintain kitchen cleanliness, it is also a must to choose the best methods on how to keep and preserve food freshness when storing. Unsafe food stocking can give way to growth of bacteria, virus and threat of food poisoning which will harm the family’s health. Choosing the highest quality kitchen containers for food storage can help preserve pantry food supplies and help reduce kitchen waste by preserving leftovers and unused food for later use. Storing food in specially designed containers can keep food fresh for a longer time. Aside from the pantry or kitchen cupboards, the refrigerator plays an important role in keeping and preserving food. It is advisable to learn proper food handling and safety measures when keeping food inside the refrigerator. Place food in tightly closed lid containers and position them in the proper fridge part to avoid spoilage, thus will lessen the risk of catching food borne diseases which may also affect your family. The primary step in proper food keeping is choosing only the highest quality and the freshest picks from the supermarket. Fresh foods such as fruits and vegetables, meat and fish are less likely to be contaminated with disease causing microorganisms. 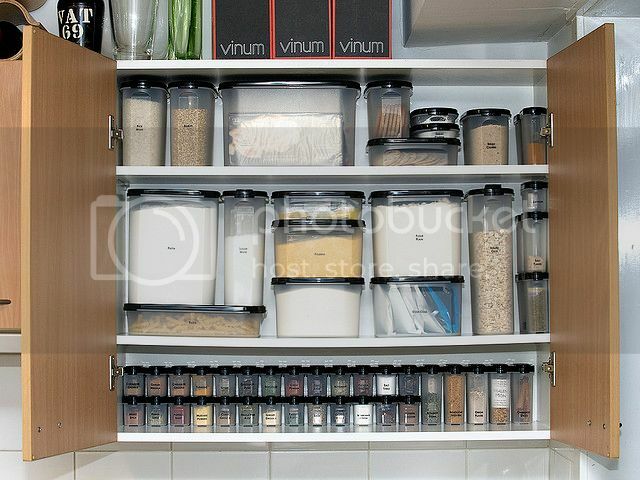 There are several storage options that you can use to store your food items which you will not use immediately. For keeping fresh meats, fish, deli and cold cuts, you should have a set of containers especially designed for cold storage. You may also use fridge containers for keeping your leftovers for future recipes or meals. These types of cold storage containers are usually compact and are able to stack well. They also have tight seals that prevent odor and freshness from seeping out. Disposable containers such as freezer bags, sandwich bags and the ever reliable Ziplocs are also considered as food storage essential by many. Some simply use food bag clips for leftover items in their original plastic packaging. Spice containers are also very important for people who cook using spices. These are tightly sealed small bottles that can protect the flavor and aroma of herbs and spices. For basic supplies that you don’t store in the fridge but are frequently used such as sugar, salt, coffee, creamer, tea and more, you can place them on properly labeled stackable containers on a corner of your kitchen countertop. These tightly sealed canisters can keep these items fresh for daily use.